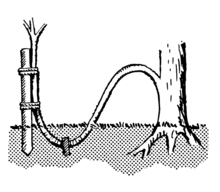 Earth LAYERING - This propogation technique involves removing a small section of BARK from a low growing branch and anchoring it to the ground so that ROOTS will sprout from the exposed area. When this happens the branch can be cut away from the main tree and allowed to grow as an independent plant. This is the propogation "method of choice" for sprawling plants like low rhododendron and creeping juniper. (Send Image) ECTOPARASITIC EELWORM - See entry for : "EELWORMS"
EDABONE>EDA BONE - The overal BRANCH STRUCTURE or skeleton of a tree. 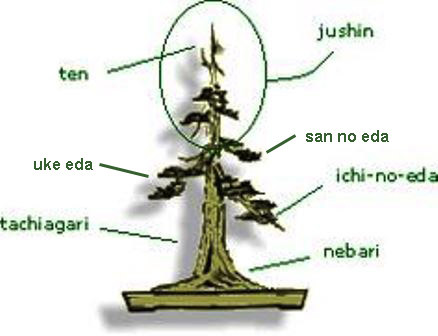 See related terms describing the position of individual branches : MAE EDA, USHIRO EDA, UKE EDA, KUITSUKI EDA and sashi eda . (Send Image) EDANUKI>EDA NUKI - Japanese term for the process of removing unwanted branches. (Send Image) EDATANYA>EDA TANYA - Japanese term describing a ramified branch forming a FOLIAGE PAD. (Send Image) EDAUCHI>EDA UCHI - The hamonising effect of BRANCH STRUCTURE. (Send Image) EDA ZAshi - Japanese term for the the process of removing unwanted branches. Convenor - Janice Tel No - 01620 825187. Meetings - First Wednesday of the month 8pm . 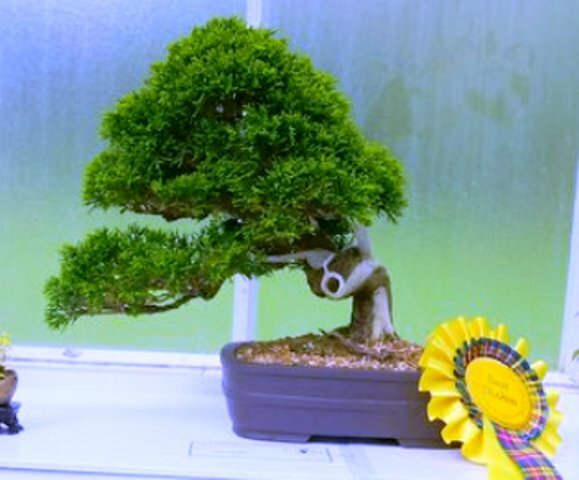 Member of SCOTTISH BONSAI ASSOCIATION (SBA). (Send Image) EELWORMS - These are worms which inhibit growth by attacking plant ROOTS. There are several types : CYST EELWORMs : which pierce the roots creating GALLS which protect them. ECTOPARASITIC EELWORMs : these may carry viral deseases resulting in yellowing of foliage from the base up. Root-lesion eeelworms : these build nests which cause canker in the roots causing yellowing of foliage and possible fungal development. Treatment requires removal of yellowing LEAVES and spraying of remaining foliage with a PARATHION based wash, plus mixing NEMATICIDES with the soil which should be prevented from excess wetness. 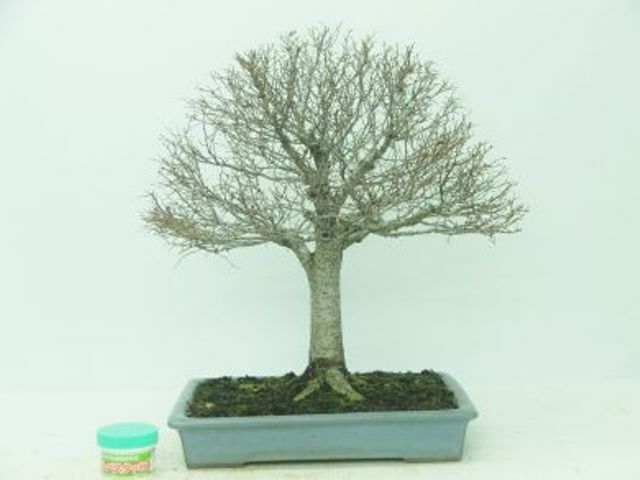 ELM - CHINESE (ULMUS PARVIFLORA) - Small, round tree with a VARIETY of BARK types ranging from smooth, grey to cork bark, both bearing small, dark green, glossy LEAVES with serrated edges. 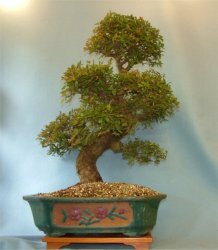 Claimed to be the most popular /best for BONSAI>BONSAI. May be grown indoors, when they will not drop leaves in winter, or outdoors, when they will drop leaves. STYLE : Suitable for all styles but delicate twigs and stout, long, flexible ROOTS make it especially suited to broom and root-over-rock styles. WARNING : SYSTEMIC INSECTICIDE s and FUNGICIDEs cause DEFOLIATION in Chinese elms. Fleshy roots need some protection from frost. ELM - ENGLISH (ULMUS PROCERA) - Small, round tree with fissured, grey-brown BARK bearing dark green, glossy LEAVES with serrated edges which are somehwhat larger than the Chinese elm. Foliage turns bright yellow in autumn. ELM - JAPANESE (ZELKOVA SERRATA) - Strong growing DECIDUOUS TREE with long erect branches growing from a short straight trunk. In winter the ELONGATED, serrated edged, LEAVES turn from deep green to crimson/bronze, orange/yellow. STYLE : Suitable for all styles but especially suited to broom and group styles (especially if trunks are not straight enough for broom). WARNING : Keep the structure light and airy as congestion of fine twigs can cause dieback - sometimes of whole branch.